The vote is in: It’s going to be wet on Election Day. 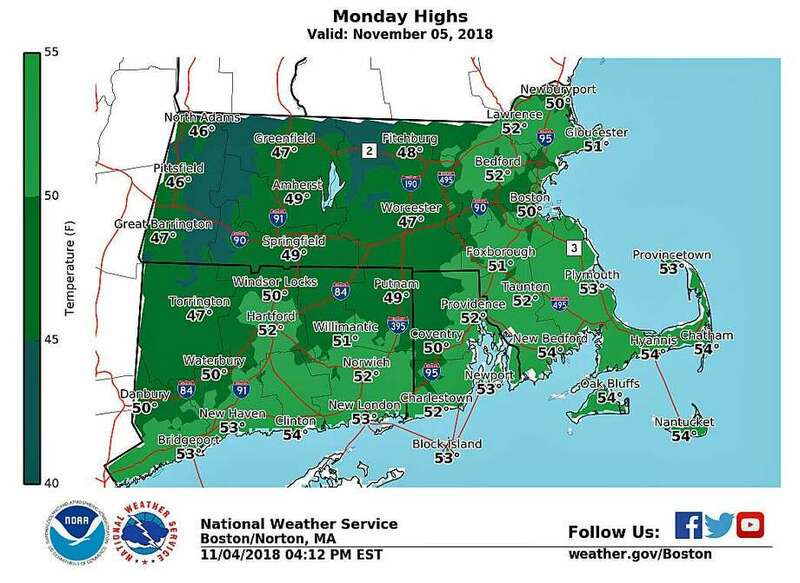 The National Weather Service says rain showers will arrive Monday afternoon and continue on Tuesday. Heavy rain Friday night and early Saturday caused the Housatonic River to pass its seven-foot flood stage. At 5:15 a.m. it was at 7.2 feet, according to the Northeast River Forecast Center. Only minor flooding is reported. So far, Sikorsky Memorial Airport has received 47.81 inches of rainfall - more than 11 inches above average. Danbury airport received 45.20 inches, about three inches above normal. Tweed-New Haven’s year-to-date rainfall is 41.27 inches, just an inch above normal. White Plains airport, near Greenwich, received 47.61 inches, about six inches above average. Today: Showers, mainly after noon. High near 46. East wind around 9 mph. Chance of precipitation is 90%. New precipitation amounts between a tenth and quarter of an inch possible. Tonight: Showers likely before 11pm, then a chance of drizzle between 11pm and 4am, then a slight chance of showers after 4am. Cloudy, with a low around 44. East wind 5 to 9 mph becoming light northeast after midnight. Chance of precipitation is 70%. New precipitation amounts between a tenth and quarter of an inch possible. Tuesday: Showers and thunderstorms before 4pm, then showers likely. High near 56. Light and variable wind becoming southeast 5 to 9 mph in the morning. Chance of precipitation is 90%. New rainfall amounts between a half and three quarters of an inch possible. Tuesday Night: A chance of showers, mainly before 7pm. Mostly cloudy, with a low around 46. West wind 8 to 10 mph. Chance of precipitation is 30%. New precipitation amounts of less than a tenth of an inch possible.